A lady sent me an email asking could I make this cake. The photo she sent was very blurred so I asked her to describe what she wanted. 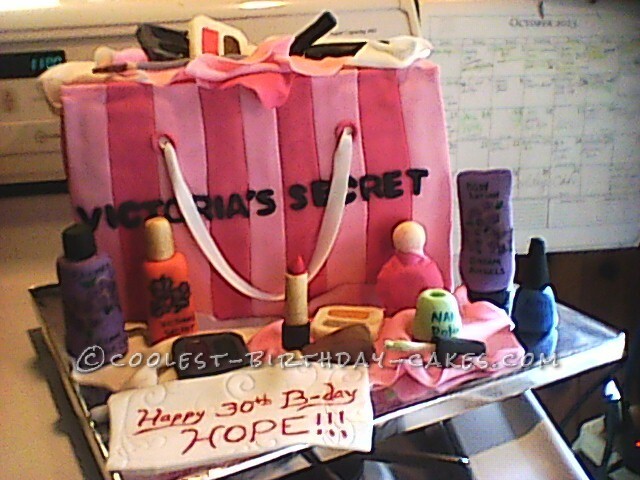 She replied back, a Victoria’s Secret shopping bag with make-up. The actual bag cake only took a couple hours to make and cover with fondant, using an old bag I had stashed away here at home to get the details right. Then I started on the make-up! 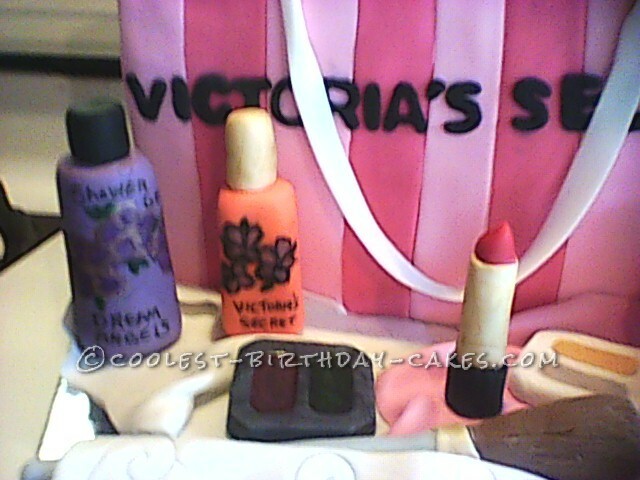 Using fondant, edible markers and deluted icing colors, I molded, drew, and painted the bottles of of lotion, shower gel, nail polish, and brushes. Using candy molds (bought from sweetmolds.com) I made the eye shadow, mascara and lipstick from candy melts. The more I made, the more I wanted to add! When one piece turned out well, I started thinking well, let’s try this! That’s how I ended up with so many accessories! The lady loved the cake and ended up not letting anyone cut it! She said it was too pretty to cut! That’s good and bad because I like for people to know that my cakes taste good as well as look good! It was a very fun cake to make. Having it turn out so well has led me to challenge myself with other cakes I always thought i could never do! !